Step 1: Application (if taking Phase 1 for the first time). Fill out this application form before you move on to Step 2. No need to wait for application approval. Your credit card will not be charged until your application is approved. Step 2: Registration. Register by choosing your options below and clicking “Add to cart”. Learn about what is included in the Advanced Techniques Course, Phase 2. A $100 late fee will be added if you register after Sunday, March 24, 2019. 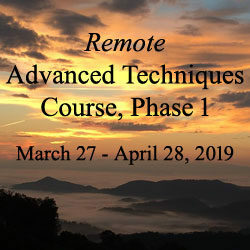 Please note: The Advanced Techniques Course, Phase 1 starts on Wednesday, March 27 and ends on Sunday, April 28. Be sure to read the Refund/Cancellation Policy.